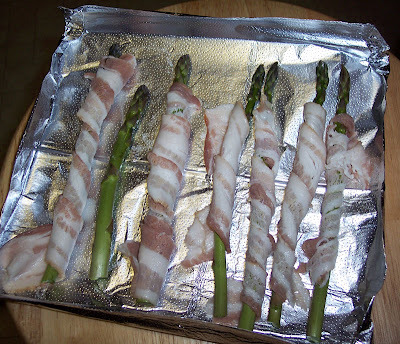 I had some asparagus leftover from dinner a couple nights ago and I've always seen it wrapped with bacon on tv so I decided to give it a shot. I like my bacon crispy so I let it cook in the toaster oven for about 10 minutes at 450. 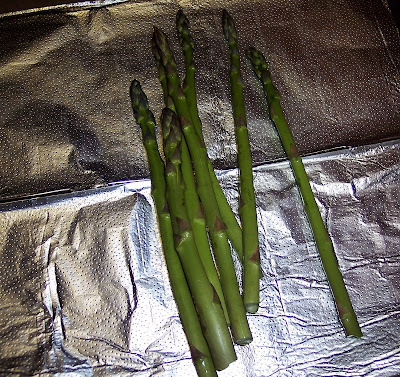 The asparagus I had were very thin spears so it overcooked a little and the tips got burned ( I like charred food so it was actually a plus) but boy was it delicious! I ate all 7 spears and was sad there was no more. Wrapped in bacon. I put it in the oven with just the foil so always fold the ends up to make a little tray so the fat doesn't go everywhere. After! 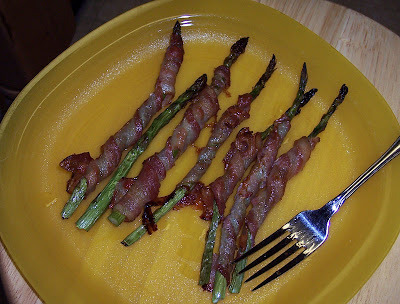 The bacon was perfectly cooked, just a little crispy and the asparagus had a good bite to it, mmmmmmmm. Sorry in advance if you hate bacon aaaah. Oh my gosh, that looks so tasty! I have to try it! They are two of my favorite foods! I could eat asparagus every day. Wish I could do that with bacon but too much salt. Bacon is so good nice and crispy. Just have it once in awhile. Thanks Mary, yes asparagus is sooo good! And bacon! Alexyndra, definitely it was delicious! Oh it is gorgeous - we use parma ham sometimes too as it's less salty than bacon. Personally I love it just boiled or grilled slightly with melted garlic butter. Mmmmm. Hi Helen, ooh ham does sound good! I love mine grilled usually too!